This vibrant collection of twenty-one poems celebrates the joys (snack time!) and pitfalls (2 + 2 = 23?) of childhood. Brod Bagert's often silly, always winsome poems cover everything from the seasons and the stars to finger paint and kids who quack. 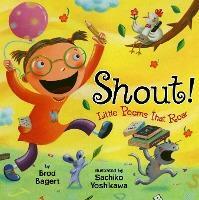 With humor and warmth, Shout! shows us there's fun in work and play, poetry in everything, and a million different uses for ketchup. Kids are sure to shout for a reread.